Swanky designs, five world-class restaurants and the largest spa in Taiwan make the Mandarin Oriental Taipei the chicest hotel you can check yourself into this side of town. The Mandarin Oriental Taipei is a hotel that just gets what you want from a vacation in the bustling capital of Taiwan: great service, excellent dining, the perfect location from which to explore the city, and hotel spaces practically designed to look good on Instagram. 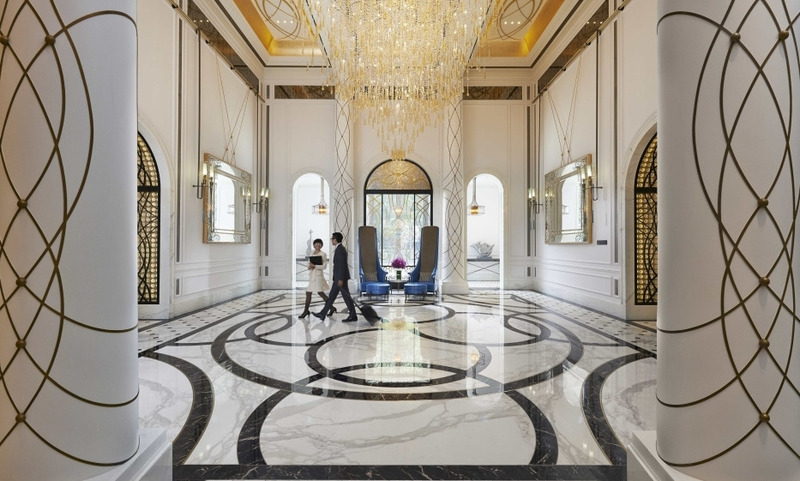 Every detail of the hotel aims to please, from the decadent lobby where a massive crystal chandelier takes pride of place to the huge lineup of dining options that count some of Taipei’s hottest eateries. Bencotto, overseen by Michelin-starred chef Mario Cittadini is that rare Italian restaurant where traditional trattoria-style dishes are as authentic as they get while just off the lobby, the Jade Lounge serves the best afternoon tea in town. The hotel also has a spa, spread over two floors, and a luxurious pool in a garden oasis so calm you’ll forget that the big city lies just at your doorstep. But make no mistake, the Mandarin Oriental Taipei is very much at the heart of the metropolis it calls home and all sites of major interest lie just a short distance away. It’s the hotel to pick if you want to be in the midst of the hustle and bustle of Taipei but tucked away in a tranquil urban retreat. Enjoy a great location within easy reach of the airport and the city’s main attractions. From exquisite dining choices to stylishly atmospheric interiors, the hotel offers an inspired choice of restaurants and bars. Spread over two floors, the world-class spa provides a tranquil escape from urban life. The Hospitality of the Mandarin Oriental Taipei blew our mind. The kind service , warmth &amp; humbleness of the staff made our stay unforgettable! People like ; Kim, Blanche, Simon ( great attitude ), Meg, Carrie, Angeline, Vivian( super sweet , lovely &amp; caring , Amanda ( cook lovely things with a lots of care ) @ the Executive lounge were all fantastic , they took very wel care of every need and special request from us . ( Big thanks to all of them ). Breakfast @ Un Deux Trois Also the attentiveness &amp; kind service of Mina, Charlene, Alice, Charles and many others names . People made a tremendous different . Food was tasty , savory and great choices . “A Beautiful &amp; Memorable”stay touched our heart and we will continue to pass it on our experience to others !!! Thank you very much Mandarin Oriental &amp; Staff, please continue the good job !!! Superb hotel. Probably one of the best in Taipei. This is the best hotel in Taiwan. Period. Few hotels anywhere match it in service. Great service and superb property. Like it and love it. Best services for the hotels that I have stayed. Will stay next time when visit Taipei. I am already a Fan of M.O. However, I am more impressed by the extra privileges offered to me by Grand Luxury Hotels.